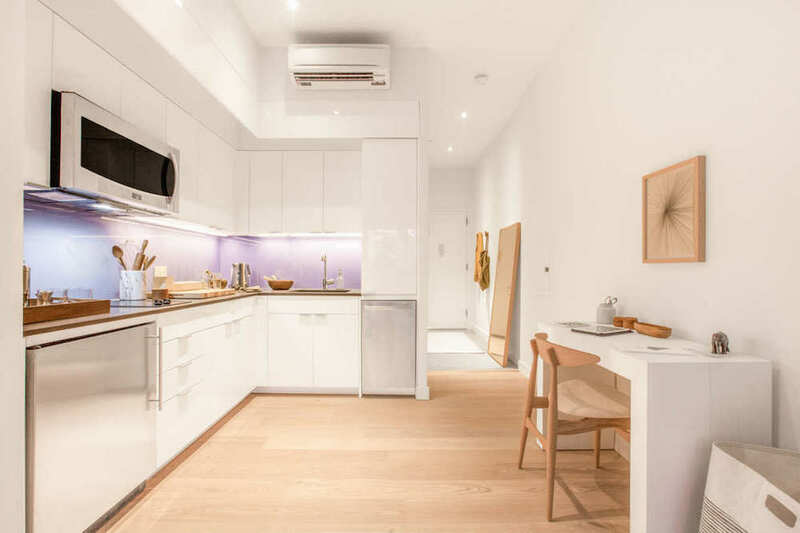 A few years ago, New York’s adAPT NYC competition drummed up a ton of public interest in micro-living. 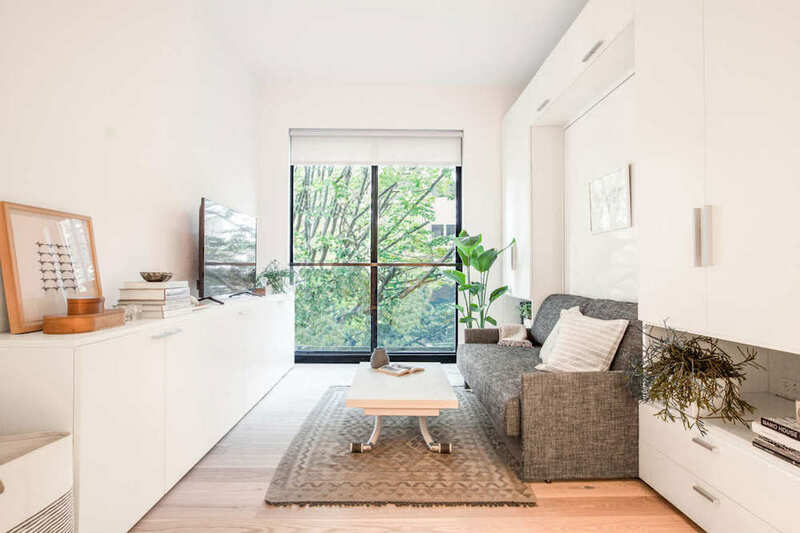 Spearheaded by the Bloomberg administration and HPD, the design and development competition sought out the world’s smartest designed, urban micro-apartments, allowing competitors to design smaller than the city’s current 400 sq ft minimum building requirement. The winner of the competition—a team lead by Monadnock Construction with a building designed by nArchitects–was announced in January of 2013 to much fanfare. Everyone was ready to move into their awesome micro-apartment in the heart of America’s biggest city. But the world of real estate is more tortoise than hare due to the intrinsic financial, technical and bureaucratic challenges of building a multi-story, multi-unit structure in a city center. But three years down the road, the tortoise is about the cross the finish line. Leasing starts today for Carmel Place (née My Micro). As we looked at earlier this year, all of the units were prefabricated in the Brooklyn Navy Yard then trucked over the Manhattan bridge to the Kip’s Bay neighborhood of Manhattan. The units were stacked into place after which the rest of the building was assembled–hallways, facade, utilities, etc. In addition to the private units, there are several communal spaces including a roof deck, courtyard, a lounge with a pool table and tv and a gym. 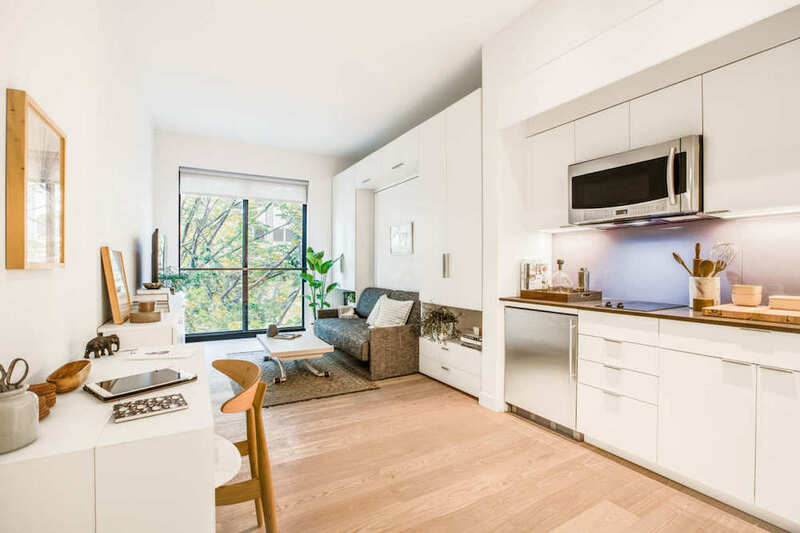 Monadnock hooked up with Ollie, a company we looked at earlier this year, to fit out eight of the twelve market rate furnished apartments that start leasing today. In addition to a number of conventional furnishings like desks and chairs, Ollie is using sofa-beds from Resource Furniture to make sure the apartments use every inch of their available floor space (units range from 265-323 sq ft). For those looking for some decorating help, Ollie is even offering an option they call the “Ollie Box”, which includes things like throw pillows, rugs and table lamps. Ollie also wants to provide a low-fuss living experience, managing several tenant services such as wifi, cable, housekeeping, and weekly visits from a Hello Alfred home manager, a service that helps take care of mundane chores and errands like keeping groceries stocked in the pantry and fridge and making sure the laundry and dry cleaning get dropped off, picked up and properly put away. Additionally, Ollie tenants will also get a Magnises membership, a social programming service to foster an esprit de communité (all included in the rent). Speaking of rents, they will range from $2540 to $2910 with floor number and unit size determining price. Furnished apartment will also command a $160/month premium according to the NY Times. In absolute terms, this is a ton of money, but in New York City terms, sad as it is to say, it’s not. Median rent for a comparable apartment is $2550, and while that apartment might be larger than one of Carmel Place’s, I assure you it will not look or perform half as well, nor will it include the bevy of included services. It should also be noted that 14 of the units are designated for affordable housing with rents around $950. But don’t stop scouring Craigslist just yet. 60K applications (not a typo) have been submitted for those units. Winners will be chosen by lottery. Eight furnished apartments will be rented to formerly homeless veterans. The balance of the building’s 55 units will become available to lease in the coming months, and move in starts February 1. The sum total of these units are a drop in the bucket of New York City’s affordable housing crisis, where more than 50% of households are considered rent-burdened, spending more than a third of their incomes on rent. But the building might point to the unfreezing of some of the city’s outmoded building code that don’t accommodate the 50%+ residents who choose to live alone. Already, the De Blasio administration is talking about lifting the 400 sq ft minimum. Unfortunately, as in all things real estate related, it’ll be several years before anything comse to pass. But if small and smart building can make it here it can…well, you know. I realize there are a lot of services included to make that price reasonable in NY, but if the lowest rent in the building (excluding subsidized rents) is the same as the median of the city, this isn’t going to bring down the cost of housing in NY. Rents still among the highest, those hot public housing. Where about lose “Bronx” soon! Due redevelopment of MTA yards…where interest. Renters rights anywhere in America?